Competition Groups – EliteForm Integrated now provides the ability to group athletes to create a competitive environment during workout sessions to increase motivation and improve athletic performance. This module builds on the ability to set velocity and power targets for trackable exercises. When Competition Groups are enabled, each rep is compared against all other reps for the athletes in that coach-defined group, giving coaches the ability to pit athletes of similar velocity and power outputs against each other. Setting Up Competitions – Setting up Competition groups is quick and easy. A new Competition Groups item is added to the Team Setup menu. 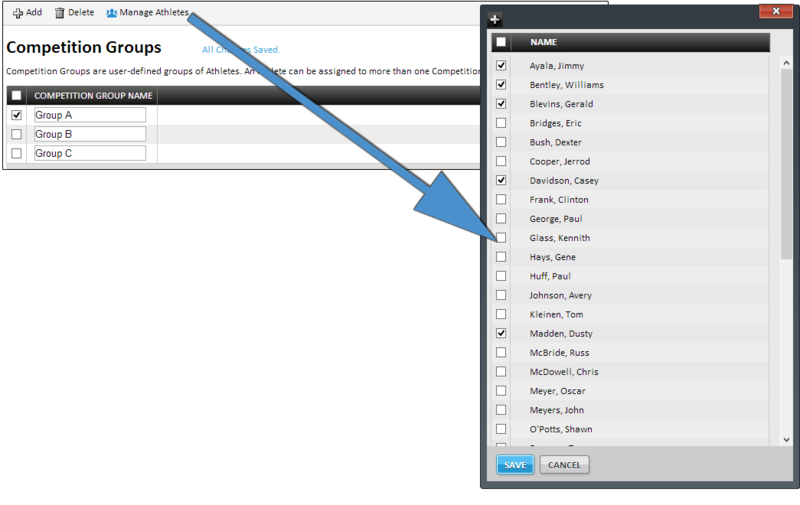 From the Competition Groups page coaches can create new groups, add and remove athletes from groups, and delete groups. Target Measurement – The target of either velocity or power that Athletes should achieve when performing Exercises that can be tracked by PowerTracker. Target Type – Select “Relative Percent” or “Absolute Value”. Target – Select either velocity (in meters/second) or power (in watts). Select the Enable Competitions check box and click Save. Competition exercises are identified by their gold background in workout designs. 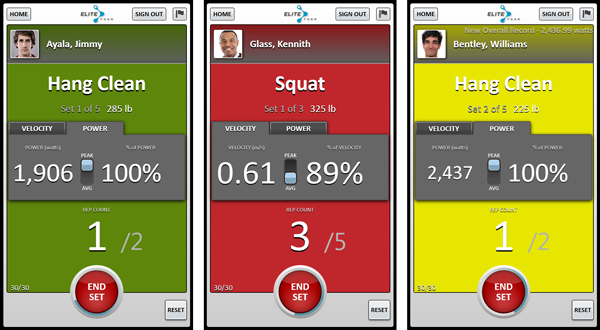 If an athlete becomes a top team performer of a specific exercise, their name, image, and achievement (amount of velocity or power) display in a banner on the PowerTracker touch screen. 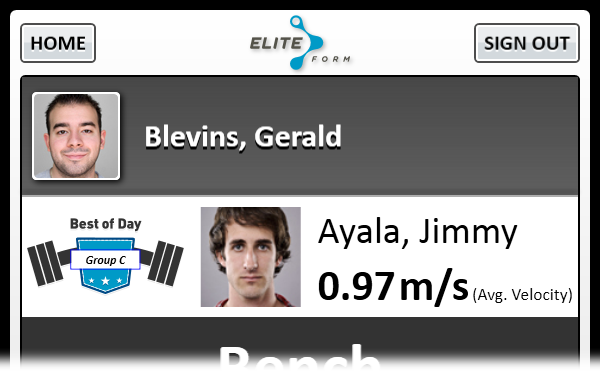 For example, Jimmy Ayala achieved the best Bench Press velocity of his team. His name, image, and amount of velocity display in a banner when any team member performs the Bench Press with Competitions enabled. These banners also display top performers in Competition groups. As each athlete performs their exercises, the top performer of that exercise in their Competition group displays in a banner along with the top team performer. For example, Jimmy, Williams, and Gerald are in the same Competition Group and are performing the Squat exercise. During his first set, Jimmy sets the velocity record in his group but not the team. His name, photo, and achievement can be seen in the banner for the other members of his Competition group. Next, Williams lifts and sets both the group and team velocity record. His name, photo, and achievement display on the banner for both his group and all the other Competition groups for the team.